Can you feel the thrill of a soprano’s high C in Allegri’s Miserere Mei or the energy in Mozart’s Misericordias Domini or the sublime angst in Amazing Grace? Singing is without a doubt, expressive, joyful and fun. Singing in a choir adds inspiration, camaraderie and relaxation. And live audiences will soak up these feelings in the presence of a choir that sings through a range of human emotions. 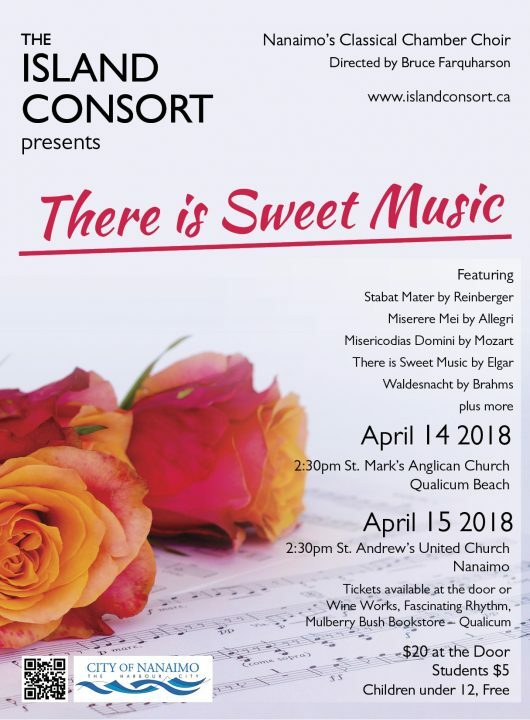 Such will be the Island Consort’s spring program, “There is Sweet Music”, that offers the richness of Early Music, the vitality of Classical Music, the sublimity of Romantic Music and the diversity of Contemporary Music. Under the direction of Bruce Farquharson, this 23-voice choir presents a first half of sacred music of Guerrero, Allegri, Rheinberger and Mozart. Accompanists include Jenny Vincent on organ and a string quintet featuring members of the Nanaimo Chamber Orchestra. The second half features secular music: Elgar’s There is Sweet Music, 3 art songs by Brahms, Daunais’ serene Le Pont Mirabeau, the jazzy Fusion by McDonald, Richards’ Le Baylére and Esenvalds’ 8-part arrangement of Amazing Grace.